Growth is the lifeblood of startups. Growth is what differentiates Snapchat from hipster coffee shops. It’s the difference between revenue-less Instagram and The New York Times. It’s why investors got excited about Yo, but worry about Apple. Through a combination of watching Intercom’s double-digit, month on month growth, and more recently through leading Intercom’s Growth team, I’ve come to believe real growth comes from somewhere deeper than Growth Hacking. I’m not even sure if Growth Hacking is a real thing. If it is, where are the prominent Growth Hacking successes? In Thinking Fast & Slow, psychologist Daniel Kahneman demonstrates that when asked a question you don’t know the answer to, your brain quickly substitutes an easier question, and answers the easier question instead. It’s the same in addressing growth; actual problems are substituted with easily measurable problems. At the highest-level, these micro definitions cause teams to overlook the most fundamental of issues: is your product solving a real problem? The foundation of all growth is product — or put another way, everyone works on growth. The only difference between product teams and marketing teams at a startup, is one is focussed on long-term growth, and one is focussed on immediately measurable growth. When a product team releases a new feature, they don’t expect to see overnight impact on signups or revenue. Contrast that to when a marketing team starts a new demand generation campaign — immediate or near-immediate results are expected. The only difference is the period in which results can be measured — both are working on growth. At a lower-level, the danger of micro definitions is they result in micro efforts. For near-term, growth-orientated product teams (often called “growth teams”) and marketing teams, focussing on the immediately measurable should not translate to focussing on the trivial. The size of the changes you’re willing to make, will directly correlate with the size of your returns. Great marketers and great product people could probably spend a lifetime on this list, and solving the problems that arise with lots of iterations, lots of small wins. 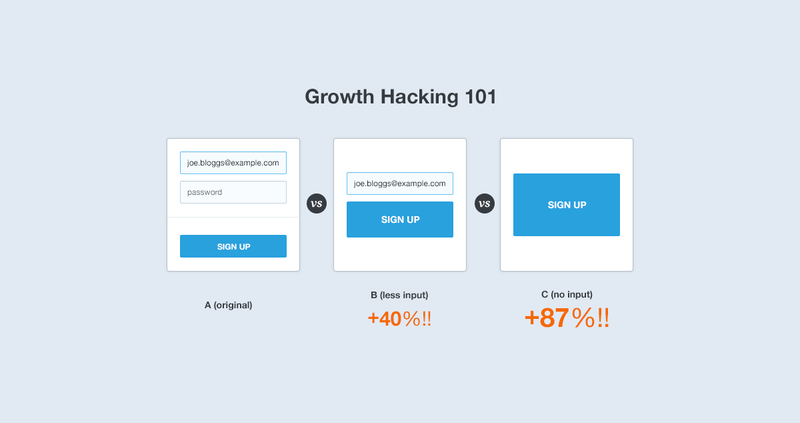 This isn’t Growth Hacking — this is product marketing, product design and product engineering. But growth doesn’t come from silver bullets. Growth comes from winning a thousand tiny battles: 0.5% here, 1% there. Real growth needs a whole load of lead bullets. Real growth originates from the very first line of code, from a great product, and from the work of an entire team. Written by Ben McRedmond, Director of Growth at Intercom. This post first appeared on the Inside Intercom blog, where we regularly share our thoughts on product strategy, design, customer experience, and startups. Intercom is a platform that makes it easy for web and mobile businesses to communicate with their customers, personally and at scale.